Monday Socks; A Grey Day, And a Chance to Talk About Texture. Good morning, readers - It's quite the cloudy day here at The Sock Review HQ, but I secretly enjoy an excuse to stay inside and focus on the blog! As I'm writing, the sunshine is peeking in, ever so slightly...but that won't change my mind about wearing these lovely socks to celebrate a monochromatic mood today. I'm not entirely sure what brand or even where these socks came from, as these were a gift from my mom a bit ago (I'm not even sure if they were intended for men or women, but that matters least to me). They are quite interesting though, not being a typical pattern one might find on a dress sock - almost gives me the feeling of being a "modern argyle," I'll call it that. You can see inside the triangular shapes, that either an extra bit of texturing has been done, or a specialized yarn has been used to create a sort of spotted effect. I absolutely LOVE texture on socks; although it does take different machinery to accomplish. If you'd like to learn some sock-knitting machinery basics (with some neat video) I recommend taking a look at this article by cottonworks™, which you can find here. Some of my favorite textures in socks (by season) are: cable knits for Fall, pointelle for Spring, a nice sheer with a swiss dot for Summer, and a fresh look at a rib for Winter. So many textures are available through socks, and I'd love to see some more experimentation like the pair featured above. I'd especially enjoy more mixed textures in shorter silhouette socks. Something I've been wanting to see in socks is a textured sock with the use of sublimation or DTG (direct to garment) printing on top - I think that could be really cool, and sort of create a 3D effect...if you know of any brand or sock that accomplishes this, please let me know - I'd love to check them out. Anyway, back to Monday socks - I hope you've enjoyed this short read about my adoration for sock textures and experimentation. Comment below on any brands you think offer interesting solutions to my sock texture "treasure hunt!" Happy Monday, sock enthusiasts! With winter days still upon us, we are excited to feature a very unique sock company - Alpine Fair socks by Ahmat - this Florida-based company sells socks made with camel wool. At The Sock Review, we are all about trying new socks and writing about what makes them unique; and these certainly caught our attention. The company was generous enough to send us a few pairs to try out. First and foremost, we absolutely love the simple, yet descriptive and decorative designs on both of the socks featured here. 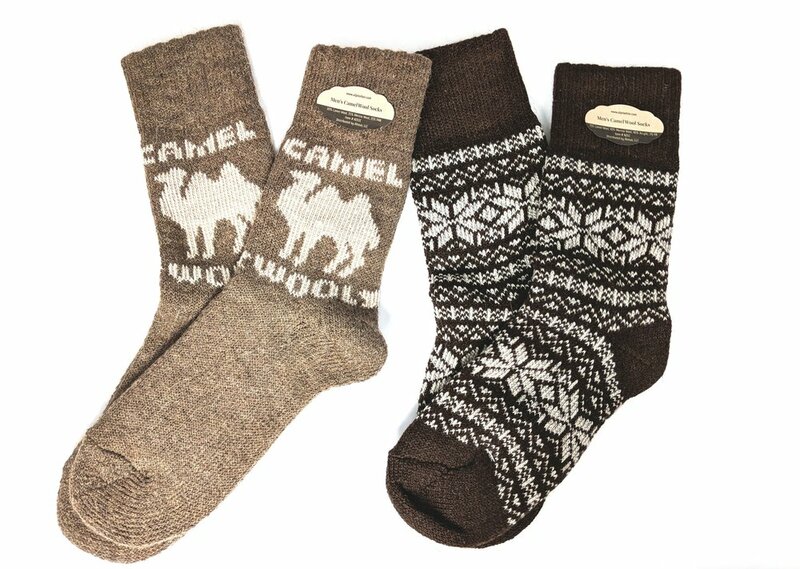 Not only do you get to show off that your socks are made with camel wool, but they are extremely warm and cozy. Perfect in case you just want to relax around the house, or if you are heading outdoors and need some extra protection on your feet. What makes these socks so lovely, in our opinion, is not only the natural fibers that are used (we prefer natural over synthetic any day, except in performance socks), but the natural color choice as well; these socks could easily be wild colors, but the way they enhance the material and style is very appropriate. Wool has antibacterial and hygroscopic properties (meaning it likes to absorb moisture from the air, helping to keep your feet dry). These socks are definitely a favorite of ours, and will surely last in our sock drawer. Giveaway Prizes sponsored by Sock Panda! Entries start today - head on over to Instagram to get the details. Sock Panda x The Sock Review Collab Giveaway is Here! Hey, it's Friday! - and it's time for another #GIVEAWAY! This time, we've teamed up with Sock Panda (who also have the cutest kids sock subscription, called Panda Pals) to give YOU a chance to win 6 pairs (that's right!) of socks of your choice from the Sock Panda collection. All you have to do to be entered to win is head on over to one (or all) of the following Instagram accounts and simply "Like & Comment why you want to WIN" on ANY of the giveaway posts from now until February 2nd, 2018. That's it! (Open to U.S. residents 18 +). The winner will be announced on Instagram, so be sure to follow along for all the fantastic fun to come! Good luck! Your sock drawer could use some more socks, right!? Who doesn't love getting packages in the mail? Well, here at The Sock Review, we most certainly do, so this month we are featuring Sock Panda's Panda Pals "Socktivity" packets; a monthly themed subscription service that is both fun and educational, including more than just exceptionally adorable socks. And good news for parents - Sock Panda, a California-based company, doesn't just offer kids styles, they also sell an array of trendy styles for adults that will be sure to fit your fashion needs. It's a "Win-Win," as kids will enjoy Panda Pals and parents & adults can appreciate giving practical gifts that are both unique and fun. One of our favorite things to highlight about the company is that Sock Panda not only delivers great product, but they are just as dedicated to giving back and supporting the community, and we certainly commend that. Just this month, Sock Panda participated in Operation Gratitude, and they also donate to various shelters, hospitals, schools and more. As a consumer, you're also helping, as with every new subscription purchased, a pair of socks is donated to someone in need. Be sure to check out more details on their website. As we poured the contents of the envelope, we found not only two pair of fun kids socks (how awesome is that grasshopper?! ), one character themed and one diamond pair that makes a great fashion statement. We also found some fun temporary tattoos, stickers and an activity page that includes word games and fun facts. All in all, we felt like this was a very creative approach to a childrens subscription packet because it provided not only fashion options, but that it was themed appropriately and the educational content showed us that there is purpose behind the concept. Very cool indeed! Next, we also had the pleasure of reviewing a second themed Socktivity packet - this one featuring Abel the Sea Star and an excellent choice in stickers and amazing rainbow pencil. Kids love learning about animals, so we truly adore the way these packages are put together. How creative it was to find that the recipient can color the activity page, and learn how to draw their own star - again, very well done. We must admit, we love the variety of trinkets that are in these packets. The socks themselves are especially adorable; here again we get a detailed character-themed sock (starfish) and a versatile icon star style that we think any kid would love to show off. Fun socks like these might even prompt some great conversations about starfish and ocean animals, you never know! The colors are great choices, and will work well with today's trends and fashion. We took a closer look at all the fun details on the Abel the Sea Star socks; how fun! It's always great to have that sort of surprise on your feet, especially if you have to wear a uniform to school or work or if you just like wearing creative, colorful socks to get some conversation going. Excellent pairing - we like the subtle "star" reference in this set because it offers the child an additional wearing experience. To wrap up, Sock Panda has a lot to offer, so be sure to check them out online and social media as well! Love what you see? We'd love to hear your thoughts, so leave your comments below! Thanks Sock Panda! We can't wait to check out some more of your designs and give some subscriptions as gifts! Pricing: $15 per month for 2 pairs included in themed package for Panda Pals Kids Socks *See website for additional sizing/pricing. — Marty Early - CoFounder of Twinkle & Co. When given the chance to put your face (and in my case, my cat's face too) on a sock, you go for it! Such a neat concept, especially in today's "selfie" obsessed culture. 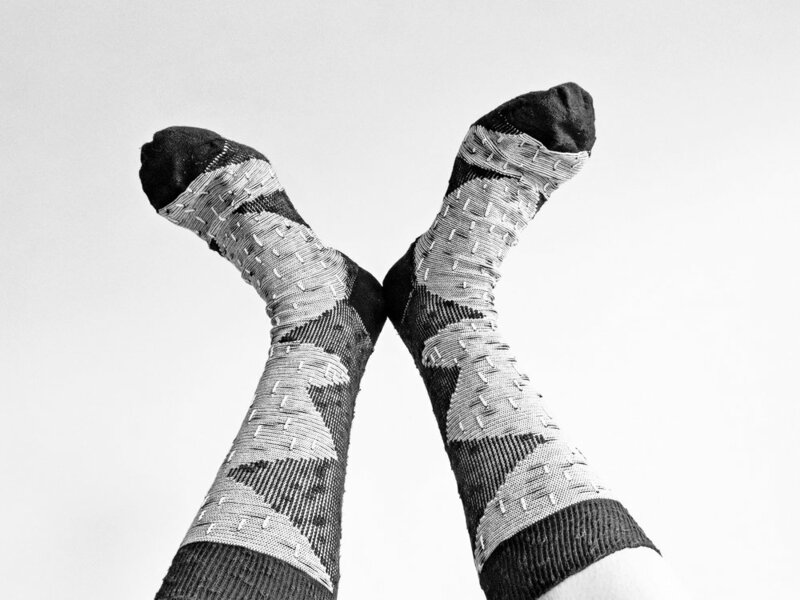 I had the pleasure of selecting a photo of my own choosing, sending it over to Twinkle & Co., and when I came back from vacation, I was pleased to find there was a lovely pair of Selfie Socks waiting in my mailbox for me. Opening the package, I was happily met with exactly what I had imagined I would be getting; a pair of crew socks with my photo on. I am impressed with the quality of printing, especially since there is ribbing on the leg. Even when wearing, the photo is still very clear, very comfortable. The crew sock I received also had arch support and the Twinkle & Co. logo is neatly placed at the top of the crew, as well as a colorful type logo printed on the bottom of the foot. What I like most about this concept is that it was developed from a desire to create a product that interacts and utilizes Instagram photos; instead of using celebrity photos on socks, Twinkle & Co. helps its customers celebrate their own personal photos and moments. Besides being a lot of fun picking out which photo you'd like to wear on yourself, Selfie Socks would make excellent gifts for friends and family in my opinion. Image provided by Twinkle & Co. - Photo Credit Twinkle & Co. While Twinkle & Co. is in its early months, I really like their energy. Being able to communicate with one of the co-founders, I was able to get a better idea on what this brand stands for. I hope you all will enjoy these customized socks as much as I do - and definitely check out their product offerings and story online. Shongolulu - Wild About Socks! What better way to celebrate the beautiful and unique animals that roam the Earth than through socks that promote wildlife conservation? Here at The Sock Review, we are proud to introduce you to Shongolulu, a brand that is dedicated to raising awareness for wild animals in need; an effort we most certainly applaud. We had a chance to ask some of the contributers of Shongolulu about the brand and its mission, and we are happy to present the following insight into a company that gives back, as well as provides quality product and design. TSR: What prompted the start of Shongolulu? Where did the idea come from and what does it represent as a brand? S: The idea to found Shongolulu came from the need to get people involved in wildlife conservation into their daily lifestyle. We thought that this is the right way to raise the awareness in the best possible way. If you are buying something that you like, you will wear it. if you will wear something with an image of the animals, people will think about that and eventually Google it. :) So this is the indirect approach. But we also decided to dedicate 10% of every dollar we make to fight against poachers. We chose the name Shongolulu because its represents persistence and unity. It's not the fastest, but it never gives up on its mission; one step at the time “A Million Feet Marching” together - This is why we started Shongolulu. TSR: Can you tell us a little more about legend of Shongolulu? This isn't a story we've heard before, and it sounds really interesting! S: Legend tells of the Shongolulu’s 18 million-year journey. What appears like a simple pair of feet is actually a million feet marching together, with the ultimate goal of creating co-existence between humans and animals. The Shongolulu is a symbol for strength in numbers and the power of ONE; living proof that even the smallest animals can have the biggest impact. With its million feet, the Shongolulu is not the fastest — but it never gives up on its dream: one step at a time. We share this dream, and together we march. TSR: What are some things that Shongolulu, as a brand, does to help wildlife conservation efforts? In your opinion, why is saving wildlife so important? S: Shongolulu, as a brand, gets society involved in wildlife conservation with fashion and fun into their daily lifestyle. Our contribution is both direct and indirect. I don’t want my kids to see elephants and rhinos in the museum like we see today the dinosaurs. Saving wildlife is so important because as the most dominant species, we have the privilege and the responsibility to protect the other species. *An aside from The Sock Review: We decided to take our Cheetah socks out for a spin at a nearby park; the combed cotton felt soft on the legs, and the cushion foot was a great comfort, especially during activity. We liked that you could see the pattern above the shoe when worn; and how neatly this pair just so happened to match with our sneakers! TSR: So, we're just wondering, is there anything the end consumer can do to help with the cause, or get involved? S: Get your Shongolulu pairs, wear, and enjoy! :) Choose your favorite animals and talk about it with your friends so we will think about animals even if they are far from us. TSR: Are there any special features about Shongolulu socks (or the other products the brand carries) that you would like to call out? S: We always focus on comfortable and the best materials. Our sleeping boxers for example, are extremely comfy. TSR: We'll have to check out the rest of your line! For our readers, you can view all Shongolulu products here. We think they would make excellent gifts for the animal-lovers in your life! TSR: Is there anything else that you would like to add? S: Shongolulu is bigger than its founders, it’s a family but also a movement. We have an ambassador program the includes the princess of Luxembourg, famous artists and influentials who really love the products and the mission of Shongolulu. TSR: We want to thank Shongolulu a lot for taking time to answer our questions; we have a good feel on the brand now and just how much they care about the animals they appreciate and are trying to protect. The Sock Review encourages you to read more on endangered animals and the companies that serve to protect them. Thanks again, Shonogolulu! We look forward to seeing more from you in the future. Where to Buy: Shongolulu website, Amazon, Uncommon Goods, & select retailers in Los Angeles and Malibu. Happy Monday Readers, I hope you enjoyed your weekend, and now back at it! Today, The Sock Review is pleased to feature one of our most creative submissions to date; MrMiSocki: A Separated Pair. A collaborative effort, written by Munish Taneja and illustrated by AT Pratt, each sock is a stand alone design that you can pair as you wish with any of the other characters. Socki is the main character in the story (shown on the far right in the photo above) and well, we suggest you get a copy of Volume 1 to read the story in its entirety. ;) Volume 2 is still up on Kickstarter, although ends soon! What we love about this product: As far as receiving socks, it is always a nice treat to receive in a branded box; especially in this case, as it ties the entire story together. You can see the "un-boxing" in my video below. Volume 1 entertains four key characters in the beginning of the MrMiSocki saga, and are beautifully sublimated* images on cotton crew silhouettes. Such attention to detail, even the cuff/welt has the brand name knit-in. The colors are vivid and let's just say I had fun "re-creating" my own version of the story for this post. What is especially neat about the four separate pairs is that even though they are all different, they still make sense; the colors complement each other so you won't look out of place when you wear them. The illustrations used on the socks are quite lovely, and that is what will show above your shoe when worn; very clever. Now back to the story...Socki goes on his quest to find his mate - through the wash cycle, where he meets some very interesting characters...does he meet his match, or is Socki taken to the dryer? You can read the entire story online here. MrMiSocki is also on Instagram; this is where The Sock Review discovered the brand. Check 'em out on Instragram @MrMiSocki. The Sock Review had some fun of their own; A little interpretation of part of the story. Really, we just had fun wearing the socks and making this video! We hope you enjoyed this look into the illustrative life of Socki and the rest of the gang - check out the rest of the adventure at MrMiSocki.com. *I will get into sublimation into a future post, but it's pretty amazing.